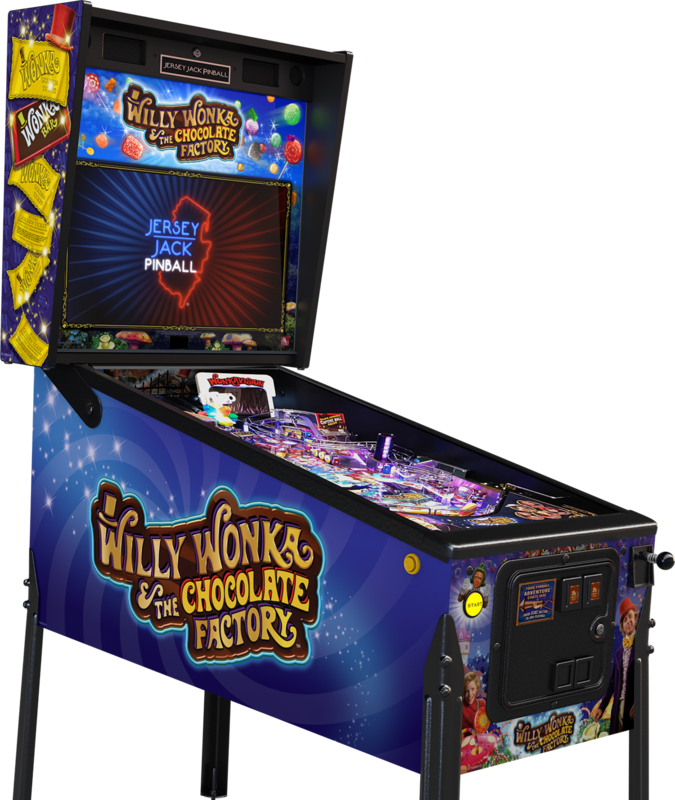 Tersey Jack Pinball announced its fifth pinball machine: Willy Wonka and the Chocolate Factory. The game was revealed by its design team on the opening night of the Midwest Gaming Classic show in Milwaukee, Wisconsin. Jack Guarnieri of Jersey Jack Pinball was not present at the show as he is attending Flip Expo in Le Treport – France, where the new game is also present. That makes it a dual continent reveal. 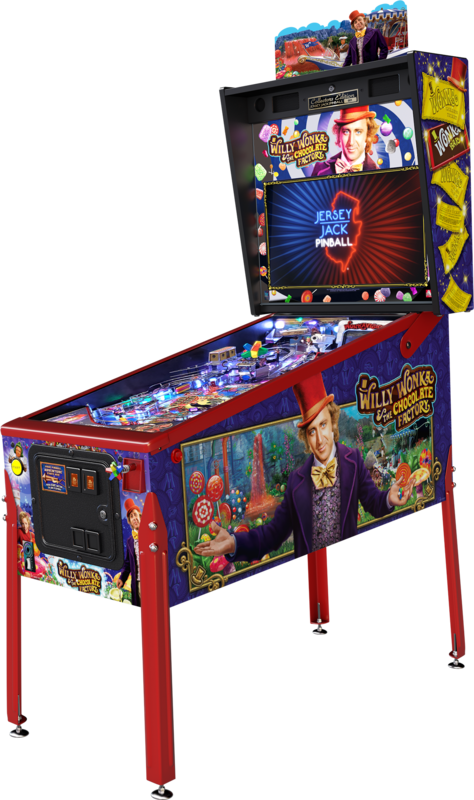 Pinball Magazine and Pinball News will be interviewing Jack Guarnieri about the new Willy Wonka game during the weekend. 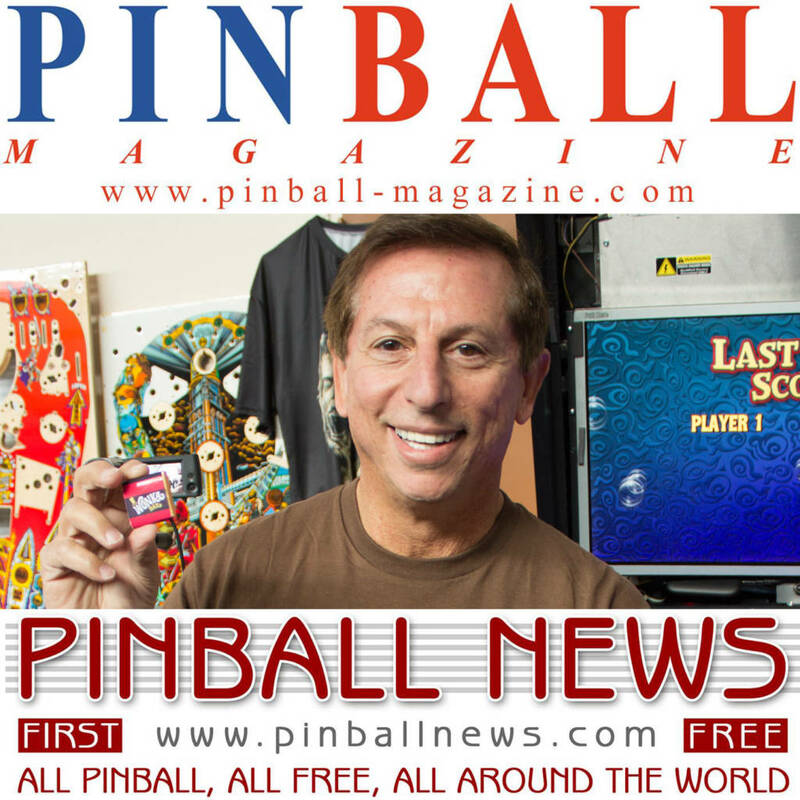 This interview will be available as a bonus podcast on the respective Pinball Magazine and Pinball News websites. 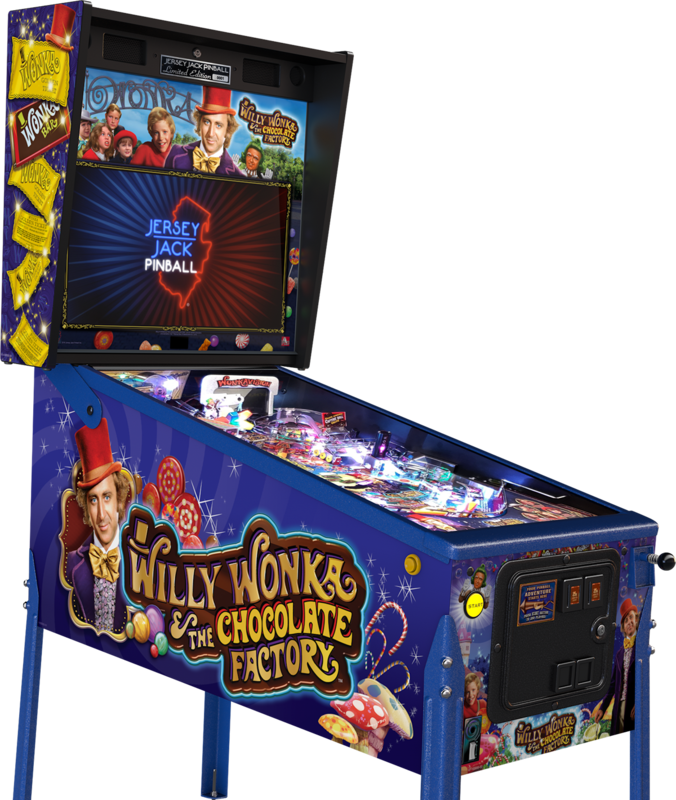 WILLY WONKA AND THE CHOCOLATE FACTORY™ is designed by legendary pinball designer Pat Lawlor, who also designed classic pinball machines such as Banzai Run, Earthshaker, Funhouse, The Addams Family, Twilight Zone and more recently Dialed In. Lawlor teamed up for this game with Ted Estes, Joe Katz, JT Harkey and Keith Johnson. Artwork on Willy Wonka has been created by John Youssi, an artist who worked on many of Pat Lawlor’s classic games. LCD animations have been in the trusted hands of Jean-Paul de Win. As the above matrix shows, the game is available in three different models. Each model has its own set of cabinet artwork and trim. A prototype game was available at the Flip Expo in Le Treport – France, where Pinball Magazine editor Jonathan Joosten got to play over a dozen games throughout the weekend of the announcement. The playfield has 4 flippers (the upper right flipper is partly under the right ramp in the photo above) and 3 ramps. The third ramp is difficult to see in the image above. The entrance is below the white Wonkavision camera, so it can be shot with the upper right flipper. This ramp goes behind the Wonkavator and then feeds the ball into the regular exit of the left ramp. The game features a rather large LCD screen, called Wonkavision, in the upper left corner of the playfield. During games the display will interact with game play and indicate which shots to make. At the start of the game the display will indicate which two skill shots are available and what they reward. The first skill shot is plunging the ball to drop into a saucer hole similar to the skill shot on The Addams Family. The alternative skill shot is to land the ball at the top of the playfield to roll towards the upper right flipper (which will flip twice before the ball is sent down there to grab the attention of the player) and then shooting the center ramp. Technically when making the first skill shot the ball will be ejected in the same lane and the center ramp can be shot as well, but I’m not sure that collects a second skill shot. The circular black thing above the Big Points insert is a flat mechanism with a moveable target hanging above it. On other prototypes, revealed at the Midwest Gaming Classic the same weekend, this black disc had an artwork decal on it to make it integrate more in the playfield. After a number of hits the black circular device will rotate 180 degrees, and as such move an opening in front of the target. The ball can drop through the opening, landing in a short subway that ends on the right side of the playfield in a Vertical Up Kicker that shoots the ball back into the shooterlane. Once the ball is back in the shooter lane, the skill shots become available again. The playfield has seven magnets. The most obvious one is located above the upper left flipper. Shots up the left (and middle) ramp will enter the Wonka factory in which the ball can roll through into the most left inlane, or a diverter will drop the ball into the left orbit lane. Here the magnet will grab the ball and hold it so the player can aim his shot across the playfield. The other six magnets are coilsized magnets placed in two groups of three. 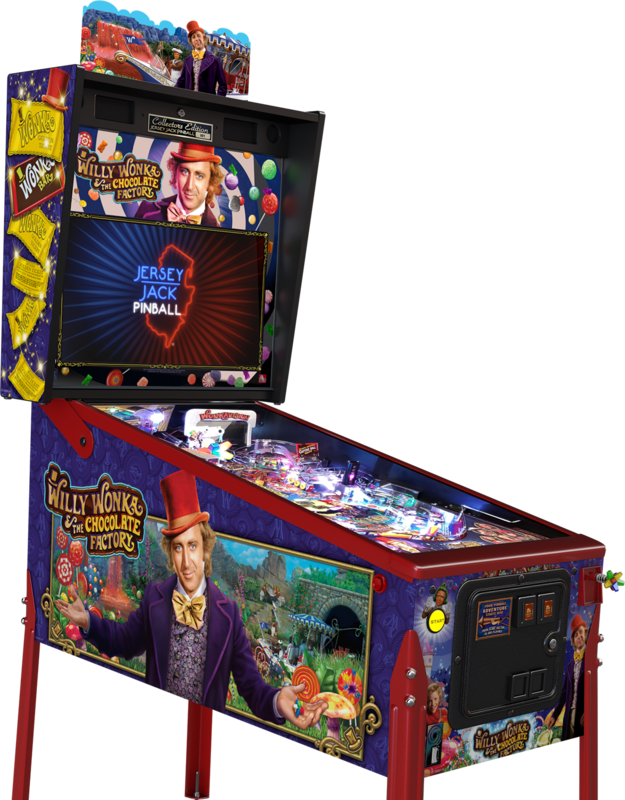 Each magnet has six small LEDs at the top, which are visible on the playfield as tiny clear inserts.One group of three magnets is located on the right of the Wonka bar next to the upper left flipper. The second group of three magnets is located on the left of the entrance of the right ramp. How these magnets will play with the ball(s) in play remains to be seen. 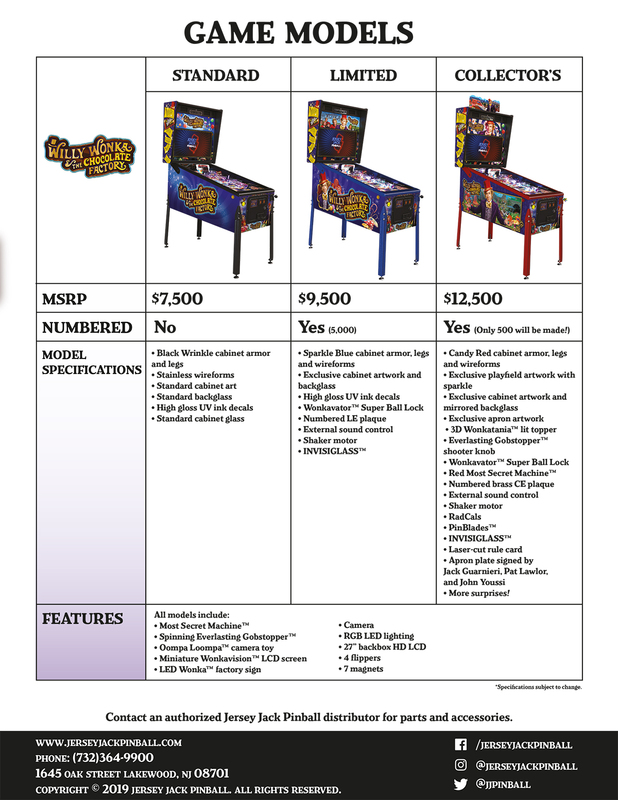 The Wonkavator in the upper left corner is only available on the Limited and Collector’s Editions. Once balls can be locked via the right orbit lane, they will be shot up via the Wonkavator and held at a mini platform, which in the image above already holds two balls. When released the balls will roll down the left ramp, where they can exit either in the left orbit lane or left inlane. As it turns out this is a carry-over feature from game to game. During the Flip Expo weekend this turned out to be a rather difficult feature to complete and the Wonakvator multiball was only played once. In terms of gameplay, the playfield layout plays very smooth, with many shots and plenty of variety. The upper right flipper is most of the time only used for the center ramp shot, although it could be used for the two shots under the Wonkavision LCD as well. The left shot under the LCD feeds to the left and exits in the left orbit lane. The right shot under the Wonkavision LCD feeds to the TAF- skill shot lane, so it’s making a short U-turn. The Wonkavator super lock has to be shot with the upper left flipper. The rather large Everlasting Gobstopper is motorised, and during gameplay it spins at various speeds. Hitting the hanging target below the Everlasting Gobstopper turns the disc and locks a ball for Gobstopper multiball. In the current software (version 0.43) it initially took only one hit to enable a lock and lock a ball. After three locks Gobstopper Multiball starts. Since this is the easiest multiball to get to, perhaps it would be a good idea to make this just a 2-ball multiball instead of a 3-ball multiball. The music in the game is very musical-like and true to the music from the movie. In a way it reminds a lot of The Wizard of Oz. So, no shredding guitars or techno beats on this game. Hitting the popbumpersplays the Oompa loompa song one syllable per hit. For video footage of gameplay, check out the following streams of the game reveal, interview with Pat Lawlor and Joe Katz and gameplay. After the reveal of the game Martin Ayub (Pinball News) and Jonathan Joosten (Pinball Magazine) sat down with Jack Guarnieri in a backroom during Flip Expo. They recorded a special bonus podcast, including an interview with Jack as well as Gary Flower calling in live from Midwest Gaming Classic. LAKEWOOD, NJ – April 12, 2019 – Jersey Jack Pinball presents a world of pure imagination! Find the Golden Ticket™ and enter Wonka’s Chocolate Factory™ for an unforgettable pinball adventure full of fun, surprises, and magic around every corner! This pinball masterpiece was designed by the legendary Pat Lawlor, designer of Dialed In!,Twilight Zone, and over a dozen other classic games, including the best-selling pinball machine in history, The Addams Family. 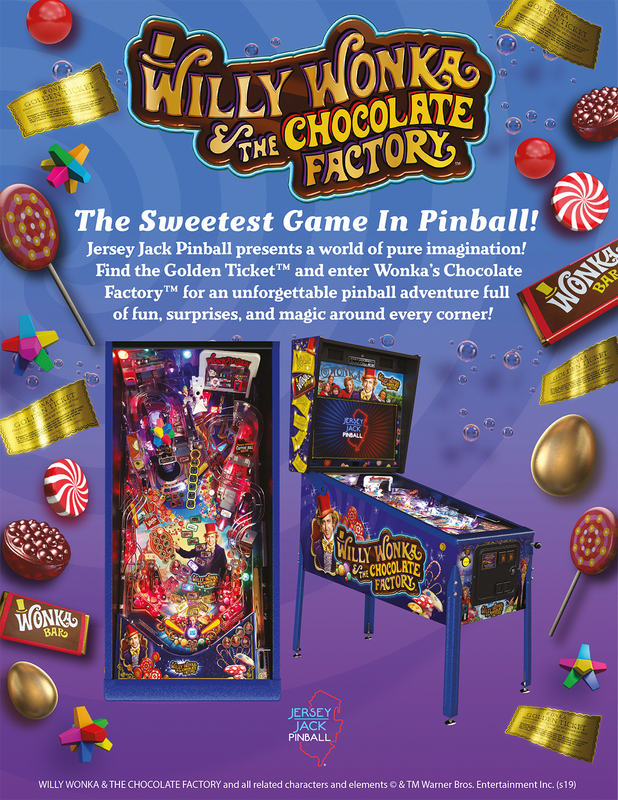 All models of Willy Wonka and the Chocolate Factory™ pinball include four flippers, six balls, seven magnets, the Everlasting Gobstopper™, the Most Secret Machine™, Oompa Loompa™ camera sculpture, 7” Wonkavision™ LCD, a 27” HD LCD screen with interactive 3D animations, and candy-colored LED light shows. Gameplay features four multiballs, collecting Wonka Bars™, spelling Scrumdiddlyumptious™, touring Wonka’s Factory™, and a host of other goodies to lead you down the chocolate river to three wizard modes, including Pure Imagination™. Scenes and dialogue from the original 1971 film directed by Mel Stuart, starring Gene Wilder, are showcased bringing this exciting theme to life. 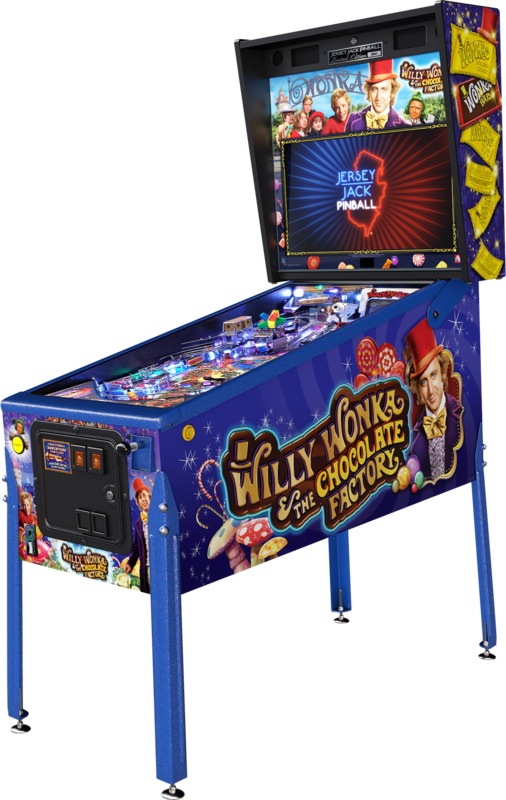 Willy Wonka and the Chocolate Factory™pinball machines will be available in Standard, Limited, and Collector’s Edition models. Only 500 units of the Collector’s Edition model will be made! 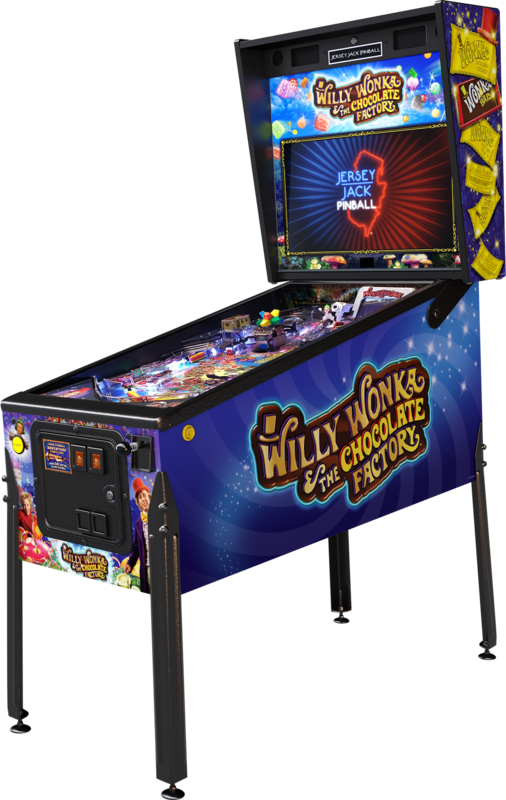 Willy Wonka and the Chocolate Factory™pinball machines will arrive summer 2019 and can be purchased directly or through an authorized Jersey Jack Pinball distributor.